In the first 100 or so years of America, clothing was considered an investment. And if you had two or three shirts you were considered wealthy. Today we are conditioned to think of clothes as disposable and cheap. We discard them simply because we want the newest fashions. When we need a new shirt we simply drive to the nearest store and plunk down a relatively small amount of money for a piece of clothing that we may keep for a season or two. It takes little effort or cash to acquire a shirt. Not so for the colonial era (or earlier eras for that matter). If you needed a shirt you had to have a sizable amount of cash to buy one that was custom sewn by someone else or you had to have the energy and time and skill to grow, spin, weave and then sew what you wanted. You were lucky to have more than one shirt per year. There were two common sources of clothing fiber that could be grown on a farm: wool (from sheep) and linen (from a plant called flax). Making clothing from flax was a laborious process. After the flax had been sown, grown and harvested, it then had to have the outer covering removed by a number of steps (read more about flax processing here). Then it was processed into a thin strand of thread by spinning it on a spinning wheel. The next job would be to weave it into a fabric. Finally the pattern was cut from the linen and the shirt was sewn together by hand. Colonial style shirts were worn for almost 100 years with very little change to the patterns. These shirts were loose fitting and were worn during all seasons. The pattern is simply rectangles and squares sewn together. Today linen is rarely grown and processed in the USA. The main growing and processing happens in Russia and Europe and dealers import it to America. High quality linen is expensive and sometimes hard to find. Interesting, as it was once considered the common-man's fabric. 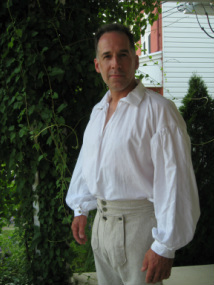 Here at Colonial Uniforms we work hard to find the best linen, linen that will last. Many companies sell garments made with an inferior quality linen and it simply does not wear well, especially for those involved in reenacting. We avoid chain-store linen and buy only from companies that produce the best.